Mastering how to blanch almonds at home really isn't all that difficult it just takes a couple of minutes and very little skill! 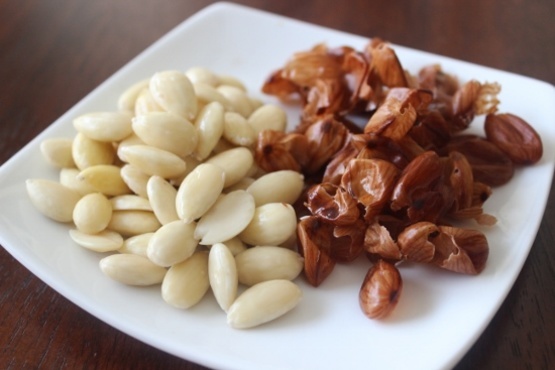 You can find roasted and salted almonds on the market as well as raw and blanched varieties. If you prefer blanched almonds, you can buy them directly from the store or blanch them yourself, a process which takes just a couple of minutes! You'll find that blanched almonds are used a lot in desserts, and make a great topping for oatmeal or added to cookies. If your interest is piqued, here is what you have to do to blanch your almonds at home. Bring some water up to boiling point in a suitably sized pan. To ensure the success of your blanching process, make sure that you use raw almonds only. They shouldn’t contain any salt or other substances. Use a medium-sized pot to heat up water up to the boiling point and then place it on a heating pad. Put your almonds in the pot and leave them there for 60 seconds. It is important to boil the almonds for just one minute because they can become less crispy if you overdo it. Cool the almonds under a powerful stream of cold water. 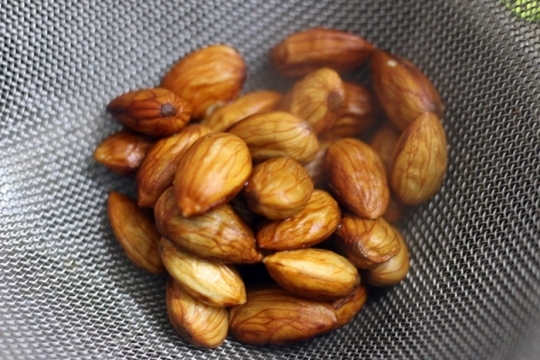 After you have boiled your almonds, use a strainer or colander to extract them (remember that the water is still hot inside the pot) and use cold water to bring them to room temperature. Most cooks put the strainer under a powerful stream of cold tap water and you can do the same thing. This will make the almonds easy to handle. Peel off the skin of your almonds. Now that your almonds are cool enough, you should use paper towels to dry them gently. Make sure you eliminate excess moisture from the surface of the almonds, they don't have to be 100% dry. The next step would be to take each almond in your hand and carefully peel off the skin by squeezing it between your fingers. The skin should fall off easily after the boiling process, but if certain skin portions are more stubborn, you might have to use your nails to eliminate those as well. In some cases, the almond might jump away from your hand as a result of the squeezing process, but you can prevent that by shielding it with your other hand. Use a large bowl to catch the blanched almonds for maximum efficiency. When you become more experienced, you can actually peel off the skins using both of your hands and dramatically reduce the time spent blanching the almonds. Let them dry for a few days. If you are not going to use the almond right away, you can put them on a baking tray and leave them there for a couple of days. Remember that you might have to toss the tray from time to time to allow an even drying process. Blanched almonds can be used in a wide variety of recipes and not only that they are healthy and delicious, they also look much more aesthetically pleasing in comparison with raw almonds which have their skin on. Eating almonds on a regular basis is highly beneficial for your health and best of all, this type of food is widely available at affordable prices.